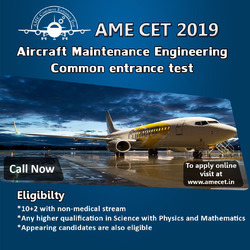 AME CET eligibility to become Aircraft Maintenance Engineer is such the candidate must have passed 10+2 examination in Physics, Chemistry and Mathematics from a recognized board or university or its equivalent. A candidate must be at least 16 years of age at the time of admission. A candidate should not have colour blindness problem. To do Aircraft Maintenance Engineering one should qualify Aircraft Maintenance Engineering Common Entrance Test (AME CET).